Introduction. Human Health Risk Assessment. Ecological Risk Assessment. Reviewing a Human Health Risk Assessment Report. 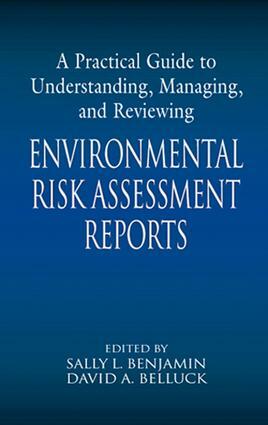 Reviewing an Ecological Risk Assessment. Legal Context for Human Health and Ecological Risk Assessment. Scoping the Risk Assessment. Risk Assessment Contract Formation. Risk Assessment Report Work Plans. A Practical Guide to Managing and Producing A Risk Assessment Report: Risk Assessment A-Z. Media-specific of Risk Assessment. Groundwater and Risk Assessment. Air Toxics. Pesticide Risk Assessment. Radiation Risk Assessment. Remediation Risk Assessment. Facility Risk Assessment. CERCLA and RCRA Risk Assessment. International Health Risk Assessment - Approaches for Pesticides. Environmental Chemistry. Environmental Sampling Design. Sampling for Ecological Risk Assessments. Toxicity Testing in Risk Assessment. Epidemiology and Health Risk Assessment. Surface Water Modeling. Ground Water Modeling in Health Risk Assessment. Air Toxics Modeling. Uncertainty Analysis. Analytical Quality Assurance/Quality Control for Environmental Samples Used in Risk Assessment. Scientific Library Risk Research for Risk Assessment. Historical Toxicology and Risk Assessment. Cost Benefit Analysis. Site Safety. Team Work. Clear Communication in Risk Assessment Writing. Risk Communication.